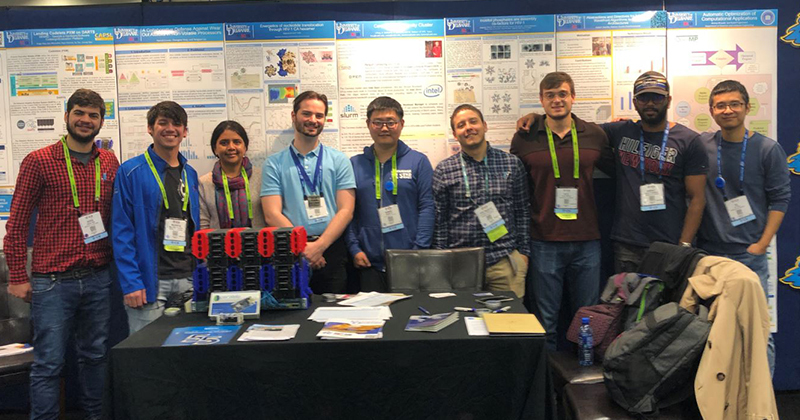 The University of Delaware was well represented by undergraduate and graduate students and faculty at SC18, the International Conference for High Performance Computing, Networking, Storage, and Analysis, in November 2018. Joshua H. Davis, a first-year student in computer and information sciences, won second place in the ACM Undergraduate Research Poster competition for his poster: Studying the Impact of Power Capping on MapReduce-Based, Data-Intensive Mini-Applications on Intel KNL and KNM Architectures. In this prestigious competition, students from across the world compete to showcase their research to over 15,000 conference attendees. Davis is advised by Michela Taufer, a Jack Dongarra Professor in High Performance Computing at the University of Tennessee, Knoxville (UTK), and Sunita Chandrasekaran, an assistant professor of computer and information sciences at the University of Delaware. Davis was a summer intern at UTK in summer 2018. Four UD graduate students were selected as volunteers at SC18. Robert Searles, a doctoral student in computer and information sciences, was the lead student volunteer. Also serving as student volunteers were: Jose Diaz, a doctoral student in electrical and computer engineering, Mauricio Ferrato, a doctoral student in computer science, and Alex Bryer, a doctoral student in chemistry and biochemistry. A poster on “Estimating Molecular Dynamics Chemical Shift with GPUs” by two Ph.D. students from Chandrasekaran’s lab, Eric F. Wright and Mauricio H. Ferrato, were accepted into the prestigious SC18 Grad Student Research Poster Category for presentation at the conference. The students also added reproducibility details to the poster. This is work in collaboration with Juan Perilla, an assistant professor of chemistry and biochemistry at the University of Delaware. UD students in computer and information sciences, electrical and computer engineering, and physics also showcased research posters at the booth. “Students from electrical and computer engineering, Diego Roa and Ryan Kabrick, built a DEMAC Cluster that drew a lot of attention on the show floor as several stopped by to learn more from the students about the cluster,” said Chandrasekaran. This cluster was built out of 24 Parallella Boards and consisted of 2 varieties of chips, a Xilinx Zynq 7000 series FPGA+ARM SystemOnChip (SoC), and a custom made 16 cores system (RISC architecture) called the Epiphany chip. Faculty members from UD were also stars of SC18. The Best HPC Collaboration between Academia, Government and Industry Readers’ Choice award went to Long time-scale simulations of the HIV Gag protein, results of a research collaboration between Perilla and researchers at the NIH and enabled by the Anton 2 at the Pittsburgh Supercomputing Center. Chandrasekaran also continued her tradition of sharing thought leadership in parallel programming at this, the premier conference of its kind. Since 2014, Chandrasekaran has been running a workshop on Accelerator Programming Using Directives (WACCPD) with her co-chairs at the SC conference. This workshop serves as a forum to bring together programming model users, developers, and tools community to share knowledge and experiences to tackle emerging and powerful parallel computing systems such as the world’s fastest supercomputer, Summit at the Oak Ridge National Lab. This year too, Chandrasekaran along with Guido Juckeland (Helmhotz-Zentrum Dresden-Rossendorf, Germany) and Sandra Wienke (RWTH Aachen University, Germany) ran the workshop for the fifth time in a row. Learn more about the papers presented here. Chandrasekaran, the Director of OpenACC User Adoption, also ran her ninth Usergroup meetup along with the OpenACC officers. (OpenACC is a high-level parallel programming model, and Chandrasekaran is a foremost expert in it.) At the meetup, conference attendees met with educators, developers, scientists, and peers to learn more about the widely popular directive-based parallel programming model, OpenACC, and how the model is being used to port real-world scientific applications to machines like Summit. Chandrasekaran has been running this meetup since SC16 not only at SC conferences but also in conjunction with ISC, PASC and GTC conference in the US and Europe. As part of the DOE ECP SOLLVE project, Chandrasekaran, Diaz and collaborators from the Oak Ridge National Lab presented their work on building the validation and verification testsuite for OpenMP 4.5 in multiple forums. OpenMP is one of the two popular programming models crucial for intra-node programming on Summit.